Reviewers agree that the Elite version of the thirteenth LeBron is really a worthy upgrade. Almost all wearers appreciate the amount of support that the Kurim and mesh upper of this Nike basketball shoe provides. Most users agree that the traction works well. The mesh upper is breathable, say almost all wearers. This pair of kicks is surely lighter than the original LeBron 13. Though the difference is not that huge, a lot of wearers still think that the Elite version provides better cushioning than the ordinary LeBron 13s. Reviewers say that this shoe is good for any playing position. All reviewers except one say that these LeBron James basketball shoes run true to size. Many wearers appreciate the sock-like fit of the shoe. One reviewer comments that the Nike LeBron 13 Elite looks ordinary. The 16th LeBron shoe, which is released in 2018, is such a huge design improvement. Even if it’s already lighter than the original version, one user still thinks that the Elites are heavy. But these kicks can’t be much heavier than the Jordan Why Not Zer0.2. There seems to be a consensus among reviewers that the Nike Lebron 13 Elite truly deserves the “Elite” attached to its name. Offered at the same price as the original, this shoe is surely the better pick between the two. It is a step up from the regular 13. Overall I feel like it looks better, it performs better; which is why, you know, it gets more points than the regular LeBron 13. I really don’t see any reason why anyone would choose the regular XIII over the Elites. Lighter without giving up support, more Zoom and better materials for the same price. The Elite version of the LeBron 13 tones down the flashiness of the original. It sheds off the Hyperposite from the upper and opts for a more streamlined look. The mesh upper is structurally reinforced by a Kurim rubber cage. For cushioning, these elite Nike basketball shoes have 6 hexagonal Zoom units: 5 in the forefoot and one big one under the heel. It sports the same traction pattern as the original. Its traditional lacing system is further reinforced by sturdy Flywire cables. Cushion. Like the original Nike Lebron 13, the elite version also uses Nike’s famed Zoom units for cushioning. The units are still hexagonal. A major difference is that the Elite has two more units in the forefoot. The additional units aim to deliver more responsiveness and court feel to the wearer. Through the shoe’s translucent outsole, the hexagonal Zoom units can be seen. They are made to protrude from the outsole so that they come into contact with the ground. Traction. Featuring a traction pattern that is a carry-over from the original, the Elite version still has thick lines on the protruding hexagonal spots. The unit directly below the ball of the foot has thick horizontal lines on one half and thick vertical lines on the other half. The same is true for the unit below the heel. The four smaller hexagonal units in the forefoot are covered with lines that are oriented in such a way that they look like they are caging in the bigger unit. This orientation ensures multidirectional coverage. Length and Width. 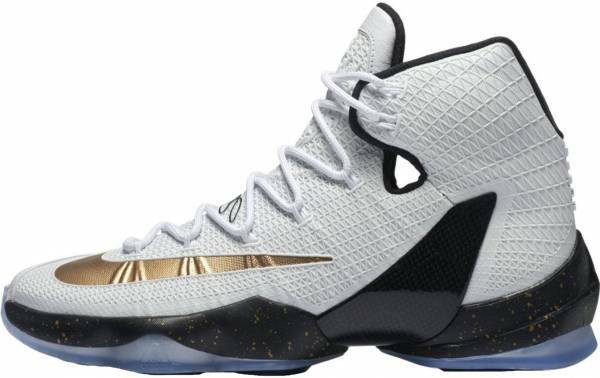 The general feedback is that the Nike LeBron 13 Elite runs true to size. Those with narrower-than-usual feet are advised to go at least half a size down. Lockdown. Like many LeBron shoes, the 13 Elite has a traditional lace-up closure that is reinforced by another Nike innovation: the Flywire. A sock-like fit is ensured by the flexible and breathable mesh that the upper is made of. To contain the foot especially during motion, the soft mesh is covered by a Kurim rubber cage. The midfoot has a carbon fiber shank to provide further lateral support. The shoe also has an effective outrigger to get rid of the annoying tippiness that most players experience. Living up to its Elite name, this basketball shoe from Nike’s LeBron collection uses a soft and breathable mesh on the upper. This mesh is covered in Kurim rubber that gives the shoe not only more support but also a boost in aesthetics. It has a carbon fiber shank at the midfoot and a premium leather cap at the medial side of the forefoot. The collar is generously padded for the wearer’s next-to-skin comfort. The Nike LeBron 13 Elite does away with the bulkiness of the original by ridding the upper of the Hyperposite units, which drew mixed reactions anyway. On top of the attached tongue is the lion emblem, which is a nod to LeBron James’s beastly and highly dominant qualities on the court. Below this is the King’s signature. Traversing the lateral side of the shoe is a huge Swoosh. The elements discussed above come together to give the shoe a more classic and streamlined appearance, making it easy to pair with jeans, shorts, and other pieces of casual wear. The LeBron 13 Elite is first released as a university red shoe. It also has storied colorways, and some are discussed in the subsections below. To celebrate the Cleveland Cavaliers’ Finals appearance in the 2015-2016 season, Nike releases a largely squadron blue rendition of the LeBron 13 Elite. The only breaks from the LeBron 13 Elite Built for Battle’s otherwise tonal blue look are the black carbon fiber shank at the midfoot, the big silver-outlined Swoosh on the lateral side, and the entirely silver small Swoosh on the medial side. Released during the NBA 2015-2016 Playoffs, the Championship Ready colorway of the LeBron 13 Elite speaks of LeBron James’s thirst for the championship trophy. This white rendition also alludes to the player’s on-court dominance by sporting a large gold Swoosh. The LeBron 13 Elite Game time is a wolf gray rendition that is released as one of the Playoffs versions of this elite model. Together with the Built for Battle colorway, Nike releases this on June 8, 2016. The Ready for Battle is a largely black version of the Nike LeBron Elite 13. The big white Swoosh on the lateral side, the smaller white one on the medial side, and the white LeBron James signature are the only breaks to this rendetion’s all-black appearance. This is made available during the 2015-2016 Playoffs.